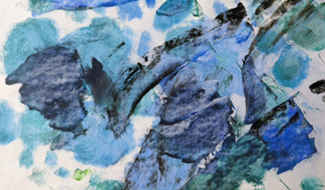 Ann received the Elisa Contemporary Art Award in the 17th annual “The Healing Power of ART” exhibition, presented by Manhattan Arts International. More than 800 works of art were submitted from artists in 11 countries, and 60 of those artworks were chosen for inclusion in the exhibition. And a special note: “Thank you!” for the recognition given to Ann’s artwork by Art Design Carta, the international marketplace for design professionals such as home decor companies and interior designers. Her paintings have recently been featured in their highlights for the landscape collections category. 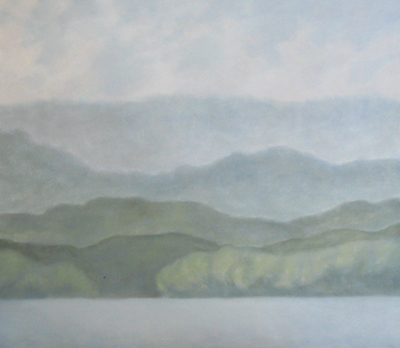 Initial steps in creating artwork: This is the first layer of a new painting. I begin by drawing in the basic areas and shapes with a neutral shade of paint, then I start adding color in tones often lighter and more subdued than the final painting will be. Although I draw with a general plan or idea, it’s not an inflexible one- if I begin a painting and it seems that the landscape naturally moves in a different direction or mood, I’ll adapt to what I’m seeing evolve on the canvas. For me, that’s part of the joy of painting- flowing with the creative process, without fully knowing what the end result will be. I know what my color palette will be at this point and I’ve established where the lightest and darkest values in the painting will appear, although that too may shift somewhat as the painting progresses. When this initial layer dries I’ll begin a second layer to further define these shapes. I paint in thin layers (often as many as 5 or more) with thorough drying time between painting sessions. A recent “work in progress” image of a botanical painting: Sometimes I find that really interesting patterns emerge while art is mid-completion. 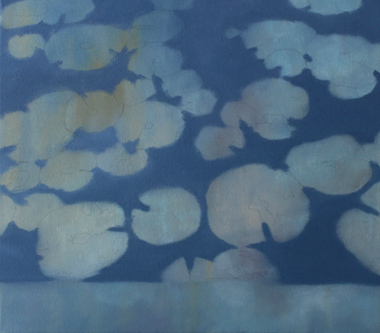 I stopped at this stage of the painting to take a photo, since the juxtaposition of the “field of blue” against the multi-toned outline of lily pads is visually interesting in and of itself, and I wanted to make a note of that effect. I’ve been painting a few contemporary botanicals and abstracts that will contain various design elements; this is an early stage of what will be a multi-layered piece that also contains symbols and calligraphy. Process: Over a thin wash of oil paint that has fully dried, I sketched the lily pad shapes in graphite, then added a layer of opaque color to further define those shapes. Artistically, I’m fascinated by the patterns created by the objects themselves, and by the spaces between objects. 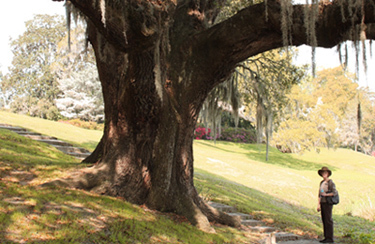 At Middleton Place: Artists and photographers alike appreciate the wide array of flowers and trees at this historic site along the Ashley River in Charleston. When not there volunteering as a museum docent, I’d often visit (sketchbook or camera in hand) to look at the first blooms of a camellia, an azalea, or the blue iris, which blossoms near Cypress Lake. 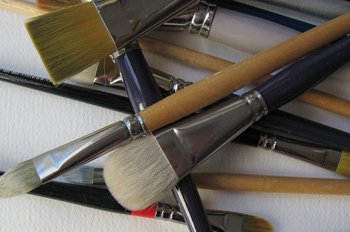 Paints and brushes: I use a variety of professional-grade paints, including Rembrandt, Grumbacher, Gamblin, Windsor & Newton and several of the Holbein oil paint shades, along with a wide range of brushes, from bristle brushes to sables, many of them “filbert” or “bright” shaped. I generally choose opaque paint colors for painting the initial layers, and add in transparent and semi-transparent shades for washes, dry brush effects, and final layers. The specific paints you choose will need to perform well both during the painting process and have durability for many years to come, so paint quality definitely matters. When choosing paint, I also look for the AP (Approved Product) designation from the ACMI (the Art & Creative Materials Institute), since safety when working with artist’s materials is an important consideration. Color theory: Whether you practice on your own, rely on color theory books, or train with a professional artist or teacher, you’ll undoubtedly encounter a wide variety of advice about the best way to approach color in your artwork. Color preferences are subjective, and many artists develop their own methods for achieving a desired look. 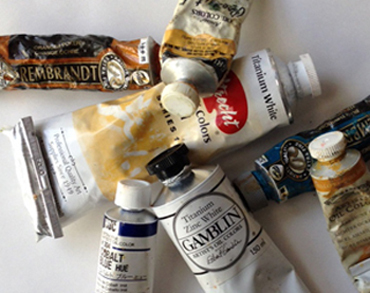 Each paint has somewhat different drying times, working properties and color temperatures, and by experimenting with a variety of paints you’ll find the paints that will let you blend and apply color for the optimum specifications needed in your artwork. Most painters begin by mastering the basics, such as blending primary and secondary colors, creating shadows and highlights, understanding color arrangements, and the use of cool and warm tones. In the process you’ll become familiar with complementary color schemes, ways of arranging color to impact mood, understanding value (where a color is located on a range from light to dark,) and working with monochromatic and analogous color schemes. Using a Quiller Wheel was helpful to me during the learning process- it’s a visual reference guide for interpreting color relationships, and mixing a range of colors. A good reference book for creating colors (with over 600 shades illustrated) is The Oil Painter’s Pocket Palette by Rosalind Cuthbert. Creating specific shades: Although I know artists who sometimes use a paint color right out of the tube with great results, each shade I use is a mixture created by combining several “standard” colors. Subtleties and gradations of color are really important in my work, so considerable “prep time” goes into color arrangements and decisions before I begin painting. 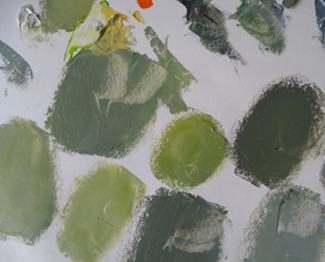 Your own painting style and approach to color will influence the color planning aspects of your artwork. Special considerations for landscapes: Landscape artists know that distance affects colors, just as atmospheric conditions do, time of day, and season. When one variable shifts, it can impact the related color (and definition) of the land, water, and sky in a scene. 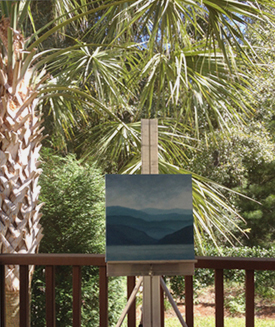 Distance is one of the primary variables you’ll encounter in landscape painting. Color perspective refers to the changes caused by distance and atmospheric details, where colors are generally stronger in the foreground, with a gradual diminishing of values toward the background. Learning how specific shades (warm and cool) and objects (ex: hills) change with distance, and how you’ll interpret those relationships in your work, is a matter of study, experimentation and practice.Some of the most helpful materials I used in the landscape learning process were books by John Carlson, Edgar Payne and Kevin Macpherson. The palette mixing process: I frequently work in somewhat monochromatic tones, because I love the look of tonalism to reflect mood and time of day, along with the softer, meditiatve qualities I’m seeking through that type of painting. (This is one of my work palettes, just having mixed various shades of blue for an ocean painting). No matter what I’m painting, I tend to do a great deal of mixing of very specific shades, which requires fresh palette surfaces throughout the painting process. I’ve been using the Blick Studio 12 by 16 palette sheets for a few years, and they work really well for me. To mix colors and move them around the palette surface, I use lightweight, flat-handled palette knives.